Mammoth the bear can occasionally be found roaming the caves in the northern part of Surefall Glades. This page last modified 2018-01-15 17:21:08. There are two wandering bears in the caves. They both path to the waterfall, but one runs away. That one you can ignore. It doesn't despawn. It will run deep into the caves and back. The one that you want to watch spawns just inside the giant waterfall from the pond outside in the cave. It wanders inside to the smaller waterfall, pauses, then moves to the three-way facing where the Bloodsaber defiler and fake wall is to the outside. It pauses there again, and then walks back to the giant waterfall and despawns. Total time while it's up is approximately under 3 minutes. The PH can be a bear cup, Poacher (notice no "a", oldschool method of finding named PHs), or Mammoth itself. Respawn time is approximately 6-7 minutes. Found Mammoth standing by the watery access to the caves at 11pm, not the later time mentioned elsewhere on ZAM. That said I have seen it (and EQ reports it is an "it", funnily enough) spawn in the early morning as others have said. Perhaps it's variable with a couple different possible spawn times? Mammoth's hide is used in the Bonethunder Staff quest. Careful, killing Mammoth will wreck your faction in Surefall and Jaggedpine...bigtime. Even Qeynos faction will most likely drop. FYI for druids and rangers. At lower levels, faction is usually just a minor irritation for most. What happens when you try to start or do your epic is another matter. Killing Holly Windstalker (mentioned in one post) or killing bears with faction such as Mammoth can make it very, very difficult if not impossible to get the epic completed. Others to avoid killing are treants, leatherfoots, and probably more that I have never thought about. Just be aware that you may be in for months of faction work just to make up for a simple kill when you were not thinking about consequences. True, and a good warning. However, this is the sort of stuff that makes EQ great and sets it apart from more recent mmorpgs as a true Virtual World. Obviously, Mammoth is a beloved inhabitant of the Glades. Thus some developer back in '98 tagged Mammoth for a HUGE faction-hit whenever he was killed. It just makes sense. The bears give a large faction hit, but Mammoth, the named Bear gives a HUGE faction hit. A fair warning indeed, given by a fellow player. And there you hit right in the middle of another typical EQ feature: in EQ you *need* a community, because not everything is easy and not everything is obvious. EQ can play tricks with you, like the Mammoth factionhit, but a game like EQ also breeds the sort of atmosphere where another player comes to the rescue and warns you about the consequences of killing Mammoth. Any more data would be happily accepted! I killed this sucker right now in self defense when coming out from behind the waterfall. He agroed me, I gave him a few good stabs of my dagger and took a NASTY faction hit. I stepped outta the water, conned the closest ranger, and he was threateningly. I went from kindly to threateningly with this kill. Anyone know what this hide is for? 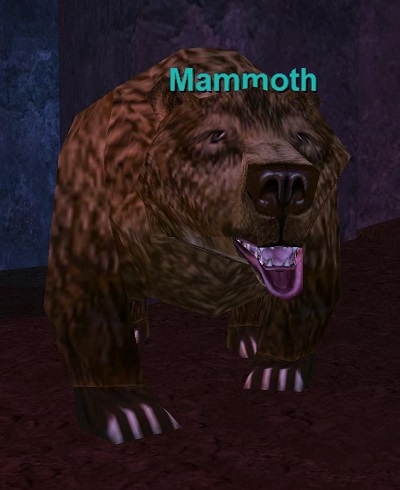 needing the third part of the bayle list, I camped mammoth in the bear cave, He is a rare spawn, but spawns next to the waterfall leading into the bear cave, not hte waterfall a little ways in, dropped him easily, but watch out bren is always near, there may be a connection between the two. "I keep clerics in business!" #Anonymous, Posted: Aug 29 2001 at 5:53 PM, Rating: Sub-Default, (Expand Post) What do you know Sanzar??? just kidding buddy. I killed Mammoth, he was green to me at 29 and I didn't get anything whatsoever. Waste of time. But feel free to kill the chump,. always fun i guess. What do you know Sanzar??? just kidding buddy. I killed Mammoth, he was green to me at 29 and I didn't get anything whatsoever. Waste of time. But feel free to kill the chump,. always fun i guess. He may be a pain to some. But I had a Ranger for a long time and had a friend with a Druid. We always fished under the waterfall. Mammoth would occasionaly walk by and we would pet him. He was always kind to us. But if you're out to poach, beware. He has a fierce bite. Where is the spawning point for this Mammoth bear! I was threre for a long time and killed other bears to see if he would spawn. I was lost in the cave and started following this wandering NPC named Bren to walk out when she walked by Mammoth who conned red. I immediately started to gate and was able to gate out but not till he hit me one time for 47 damage! Scary bear don't let his cuteness fool you!